Good news, Stargate fans! Original movie director Roland Emmerich wants to make more! The bad news? He doesn't want to continue the massive original universe as seen in SG-1, Atlantis, Universe, Infinity, and The Legend of Curly's Gold, but will reboot the franchise with a new movie trilogy. Right now, this trilogy is merely in the "pitched to MGM" phase, which could easily get busted down to a single movie, assuming it gets approved at all. Also, please remember that Emmerich has been talking about an ID4 sequel for over a decade at this point, and we never appear to be getting any closer to that either, so the original Stargate universe could be safe for quite some time. 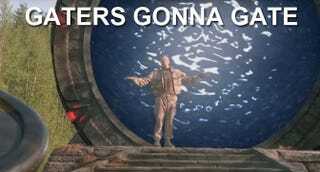 I'm curious, though: Would you Stargate fans prefer a reboot or would you rather the franchise just be done?